When thrown in the deep end, sometimes it takes some a little longer to kick back to the surface. 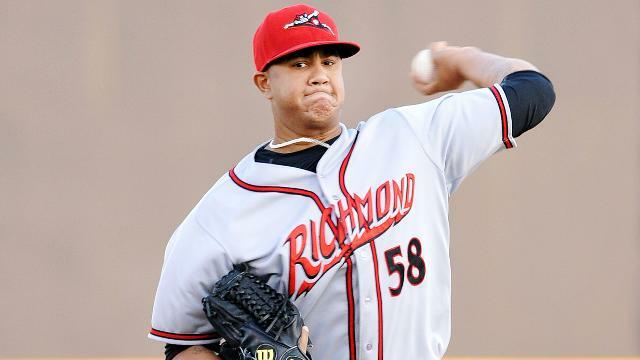 That was the case with Adalberto Mejia, who started the season with Double-A Richmond at age 20. The promotion wasn't unwarranted -- he put up a 3.31 ERA and held opposing batters to a .228 average across 87 innings for Class A Advanced San Jose in 2013 -- but there were struggles that followed. Through his first 11 starts (52 1/3 innings) in the Eastern League, Mejia put up a 6.36 ERA and opposing batters were hitting .310 against him. His BABIP was high at .343, and his FIP -- which strips off defense -- up to 4.68. Sunday must have felt like a breath of fresh air for the left-hander. The Giants' No. 3 prospect set season highs with seven strikeouts over seven innings, scattering four hits and a walk along the way, in the Flying Squirrels' 2-0 win over New Hampshire at The Diamond. Mejia retired the first seven Fisher Cats he faced before issuing his only free pass to Jack Murphy with one out in the third inning. The four hits came in pairs during two separate frames -- the fifth and seventh -- and it was in the latter that he needed to escape the biggest jam. The southpaw allowed a one-out double to Andy Burns, and Yusuf Carter followed that up with a single that put runners at the corners. But Mejia recovered by striking out Mike Crouse on three pitches and getting Jack Murphy to ground into a forceout. The native of the Dominican Republic was pulled after the frame, having thrown only 79 pitches, 58 for strikes. The low pitch count came as a result of Mejia's ability to control the zone early in almost each at-bat; he threw first-pitch strikes to 19 of the 26 New Hampshire batters he faced. As such, 16 of those plate appearances, including all five in the seventh, lasted only three pitches or fewer. "I think the biggest thing with the pitching staff is that they are working ahead," Richmond second baseman Matt Duffy told the Hopewell News. "The stuff wasn't the issue, but now they are getting ahead and that's what leads to results on the field." With the win, Mejia (3-5), who received 55 grades on his fastball and slider and a 50 on his changeup from MLB.com, picked up his second win in his last four starts and dropped his ERA from 6.36 to 5.61. Through 12 starts, he sports a 5.61 ERA with 48 strikeouts and 15 walks in 59 1/3 innings. While his ERA is still above his 2013 marks, the left-hander's strikeout walk (2.3 BB/9) and home run (1.2 HR/9) rates are all at about the same levels, while his K/9 is down from 9.2 to 7.3. That command, along with his 6-foot-3, 195-pound frame, is expected to carry Mejia through a Giants system stacked with arms. MLB.com declared Mejia has "the ingredients to become a No. 3 starter, and if his pitches continue to get better, he might even be a No. 2." Richmond designated hitter Devin Harris smacked a two-run homer for the Flying Squirrels in the sixth. Hunter Strickland and Cody Hall pitched scoreless eighth and ninth frames respectively to preserve the shutout, with Hall picking up his fifth save. The Squirrels are 10-4 in June and now stand half a game ahead of Akron in the Eastern League's Western Division. "We've had a two-week stretch where we have been playing well," manager Russ Morman told the newspaper. "We've been following the formula that we've talked about all season by having good pitching, timely hitting and solid defense. We have been very efficient in all three phases of late." New Hampshire right-handed starter Scott Copeland (5-6) suffered the loss after allowing two unearned runs on four hits in seven innings.